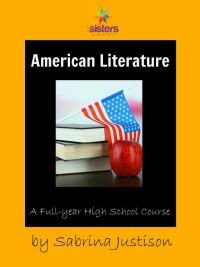 American Literature is a guide that takes high school students through the study of nine novels or plays, specially selected to form a complete year-long study of American literature. The course requires a significant amount of writing, although the writing requirement can easily be adjusted depending upon the level at which a student is able to function. Some work in vocabulary, note taking, grammar, and public speaking is included, but often this depends upon which assignments a parent or teacher requires. A chart shows various ways to structure requirements for the course for four different levels of difficulty: average, college prep, advanced, and honors. The chart also shows requirements for each year of high school. The amount of reading and writing varies greatly depending upon which requirements are selected. For example, the freshman level for average students has students read 15 books (among them must be three classics, and five can be books of the Bible). They must also write four short papers, two essays, and one 5-page paper. On the other end of the spectrum, an honors level senior is assigned 50 books to read (among them must be six classics, and 20 can be books of the Bible). They will write eight short papers, eight essays, and two 10-page papers. While the guide doesn’t present specific recommendations for remedial students, you can adapt by requiring fewer books and papers. You can vary these requirements since they are only suggestions. The American Literature course incorporates nine individual study guides and their answer keys, all available only as digital PDF files. The basic course assigns one novel or play per month. There are separate files for each of the student and teacher guides. Student guides are editable PDF files with space for students to write (on a computer) directly into the file. (This should help them keep everything organized and easy to find.) Files can also be printed out for students to write in by hand. For each family purchasing the course, the publisher gives permission to make as many copies as they like for use within their own homeschool, either digital copies saved to various devices, or print copies. (No copies of the curriculum can be shared outside the family.) Be sure to make copies of the editable files before students write in them! Each guide includes background information on the author and the book plus a list of vocabulary words. It is up to you to determine how to work with the vocabulary words. The background information highlights topics upon which the study will focus. This varies from study to study. For example, in the study of A Separate Peace, symbols and motifs are the primary emphasis, while the protagonist's character is a secondary focus. The study of The Scarlet Letter devotes attention primarily to character development and inferential reading. Shifting toward a more philosophical direction, the study of Little Women highlights transcendentalist elements in that story. Most study guides have discussion questions for each chapter or groups of chapters (or for scenes within acts of a play). Students are directed to write answers to these questions in complete sentences or paragraphs. Some of the guides have significantly more questions, more writing assignments, graphic organizers, or differ in other ways from one another. Questions in all of the guides range from simple comprehension questions to those requiring deeper critical thinking. Writing assignments also challenge students to apply various levels of critical thinking. Students should be able to complete most work independently. However, they are encouraged to discuss their answers with others. It would be great if students could meet with other students once a week for discussion, but periodic discussion with a parent can suffice. Suggested answers for questions are in the parent/teacher files for each guide with the exception of Little Women, for which the questions all require essays with unpredictable answers. No suggested responses are provided for some open-ended questions, essays, and other writing assignments. In many cases parents might be able to evaluate essays and papers on their own merits without regard to the content of the book. However, some writing assignments as well as discussion participation require that parents familiarize themselves with the books. A few of the study guides have a couple of overarching activities relating to the theme at the beginning. At the end of all study guides are suggested enrichment activities that present topics for further writing, listening, or other types of activities. Requirements for the more challenging versions of this course will be met by using at least some of the enrichment activities. The introduction of the American Literature course includes many more activities in addition to those within each study guide. These suggestions might be used for one of more of the books that are read. Suggestions include written assignments as well as others such as public speaking and watching a movie version of one of the books and writing a comparison and contrast paper about both. The introduction to the course also includes a list of suggested additional reading for students aiming beyond the average course level. In addition to novels, this list includes short stories, poetry, essays, speeches, tales, and folklore. While moral questions and faith play a part in some of the literature, the guides take a secular approach. Parents or teachers can easily add discussion of some the questions from a faith-based perspective. The mention of books of the Bible as possible books to be used to be used to meet reading requirements does not change the nature of the course. American Literature should be a great option for those who want a whole-book approach to literature. The flexibility of this course makes it suitable for almost all students. While a co-op type class should be very helpful for both parents and students, the course should also work well for students studying on their own. Click on the image to purchase directly from the publisher using our affiliate link.